This volume of essays explores major interpretations of Romans by Greek Fathers. This collection of essays integrates scholarly and scriptural interpretations, Eastern Orthodox biblical scholarship, together with biblical interpretations throughout church history. 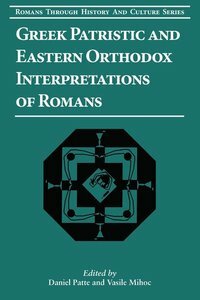 Unlike the Western interpretations that read Romans in terms of theological anthropology, the Greek Fathers do not presuppose such a concept and therefore each of the articles in this volume invites Western scholars and students to re-read Paul's letter with new eyes: with a greater sensitivity to the nuances of the Greek text; with an openness to envision what Paul is saying from very different theological and hermeneutical perspectives; and with the awareness that the Greek Fathers addressed particular contextual issues of their time. About "Greek Patristic and Eastern Orthodox Interpretations of Romans (#09 in Romans Through History And Culture Series)"
Cristina Grenholm is director of theology and ecumenism in the Church of Sweden. An ordained minister, she is also coeditor (with Daniel Patte) of Gender, Tradition, and Romans: Shared Ground, Uncertain Borders and Reading Israel in Romans: Legitimacy and Plausibility of Divergent Interpretations. Introduction; Vasile Mihoc, Facultatea De Teologie 'andrei Saguna', Sibiu, Romania. Basic Principles Of Orthodox Biblical Hermeneutics As Rooted In The Greek Fathers' Interpretation; Daniel Patte, Vanderbilt University. How The Essays In This Volume Complement Each Other; Matthew W. Bates, University Of Notre Dame. Prosopographic Exegesis And Narrative Logic: Paul, Origen, And Theodoret Of Cyrus On Psalm 69:22-23; Steven Dimattei, University Of Houston. Adam, An Image Of The Future Economy: Romans 5:14 In The Context Of Irenaeus' Christological Exegesis Of Genesis 1:26; Archbishop Demetrios [trakatellis], Primate Of The Greek Orthodox Church In America. "being Transformed": Chrysostom's Exegesis Of The Epistle To The Romans; Vasile Mihoc, Theological School Sibiu. St. Paul And The Jews In John Chrysostom's Commentary On Romans 9-11; George Kalantzis, Wheaton College. The Voice So Dear To Me: Themes From Romans In Theodore, Chrysostom, And Theodoret; Bruce Lowe, Macquarie University-sydney. What Does Proecho Really Echo In Romans 3.9? Re-evaluating Arethas & Photius' 9th-10th Century Greek Interpretations; Stelian Tofana, Babes Bolayi University. The Interdependency Between Destiny, Humankind And Creation According To Rom. 8:18-23: An Orthodox-patristic Perspective; Conclusion; Daniel Patte, Vanderbilt University. Some Of The Theological; Hermeneutical, Contextual, And Analytical; Textual Choices Made By Greek Fathers And Eastern Orthodox Interpreters Of Romans; Biographies Of Contributors; Indices.